Ce document au format PDF 1.4 a été généré par QuarkXPress(R) 11.2, et a été envoyé sur fichier-pdf.fr le 03/02/2016 à 15:05, depuis l'adresse IP 197.116.x.x. La présente page de téléchargement du fichier a été vue 354 fois. Taille du document: 4 Mo (318 pages). added as a separate rule. “Junior” has become “u20” and “youth” is now “u18”. iAAF over a 100 years ago. affiliated to one of the six Area Associations. 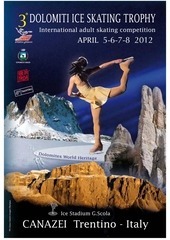 participating in an international Competition. Mountain Running and trail Running. Court of Arbitration for Sport in lausanne. appropriate legal status in the territory under applicable laws. in the territory under applicable laws. Member in accordance with the rules of the Member. the terms of the Constitution. the international Association of Athletics Federations. Members participate by invitation of the Meeting Organiser. or who is competing in an international Competition under Rule 35.7. A national governing body for Athletics affiliated to the iAAF. another body affiliated to a Member. relevant authorities as having his primary and permanent home. Anti-Doping and Medical Rules only. also include references to the plural. Competition Rules and practical guidance for their implementation. does not have exclusive control. participants from a single Area. Members or Areas or combinations thereof. organised by an Area Association. of u18 and u20 category competitions. in total, or uSD 8,000 for any one event. (g), (h), (i) and (j), failing which those of the iAAF shall apply. steps as it deems necessary. included in the world Athletics Series. listed in Rules 1.1(b), (c), (d) and (e). consultation with the iAAF regarding the date. as may be established by the Area Association. may participate in those competitions, subject to Rules 4.2 and 4.3.
amended by the Council as it sees fit. authority which is not provided for in these Rules. athlete’s National Federation of origin is not received within the 30day period, the authorisation shall be deemed to have been given. and who comply with the eligibility requirements of this Rule 5. Competition held under Rules 1.1(a), (b), (c), (f) or (g). subject to the provisions of Rule 5.4(d). 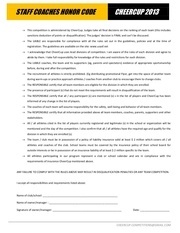 demonstrating the athlete’s eligibility under this Rule. negotiate their own Athletics programmes. services who is not an Athletes’ Representative. Representatives who are nationals of their Country. accordance with the Rules and Regulations. this Rule and with any Regulations that may be passed hereunder. domestic or international, shall be allowed. comply with any applicable safety regulations. has not been declared ineligible. held under these Rules or the rules of an Area or a Member. (a) whose National Federation is currently suspended by the iAAF. awards, medals, points and prize and appearance money. in Rule 40.11 shall apply. period of ineligibility had been served. may be declared ineligible under this Rule 23.
operations in conjunction with data protection legislation. therapeutic purposes or are intended to enhance sport performance. the use of a Prohibited Method. the iAAF, wADA and National Anti-Doping Organisations. or the iAAF Council from time to time. Council from time to time. technical documents) and the Anti-Doping Regulations. in, or preparing for, Competition in Athletics. party not involved in the Attempt. prior to the determination of an Adverse Analytical Finding. the Court of Arbitration for Sport. An event or series of events held over one or more days. those venues so designated by the ruling body over the Competition. established by the ruling body of the Competition. 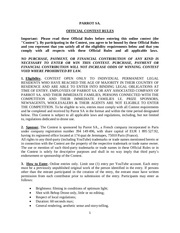 Persons entitled to earlier notification in accordance with Rule 43. See Consequences of Anti-Doping Rule violations above. Javelin throw) including any qualifying rounds thereof. of such event and the Sample collection process related to such event. addressed by the international Standard were performed properly. pursuant to the international Standard. for any continental, regional or other international competition. indicates the use of a Prohibited Substance or Prohibited Method. Any substance produced by a biotransformation process. A natural Person who has not reached the age of eighteen years. international Standard for testing and investigations. the organisation recognised by the international Olympic Committee. responsibilities in the anti-doping area. moment of notification through to Sample provision. the Prohibited Substance entered his system. Any period which is not in-Competition. Any Athlete or Athlete Support Personnel. or an organisation or other entity. Substance or Prohibited Method and intended to exercise control over it. to the iAAF, a Member or an Anti-Doping Organisation. Any method so described on the Prohibited list. and are required to provide whereabouts information for that purpose. Any biological material collected for the purposes of Doping Control. National Anti-Doping Organisations and wADA. part be demonstrated in order to establish an anti-doping rule violation. provided a sufficient basis on which a case could have been brought. prevent normal procedures from occurring. the international Standard for testing and investigations and/or the AntiDoping Regulations. or are intended to enhance sport performance. therapeutic use exemption as described in Rule 34.8.
means whatsoever of any Prohibited Substance or Prohibited Method. A Filing Failure or a Missed test. agreement, membership, affiliation, authorisation or accreditation. management authority set out in such rules. 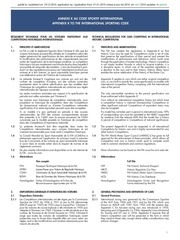 imposition of sanctions under Rule 45.
other Person to whom the notice is applicable. (d) the iAAF Anti-Doping Administrator. Ce fichier a été mis en ligne par un utilisateur du site. Identifiant unique du document: 00397739.